12/19/2012- Casey Dill goes to Las Vegas to be a Train Robber The Las Vegas Train Robbers will have Casey Dill be their inaugural field manager. 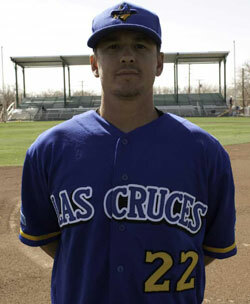 Casey Dill was one of the top managers in the Pecos League in 2012 with the Las Cruces Vaqueros. He lead the Vaqueros to the 2nd best record in the league and lost the championship game to Alpine. At the conclusion of the season Dill had seven players promoted to the Frontier League and in the off season Jimmy Parque signed with the St Louis Cardinals. "I am excited with the lower travel and centralized location of Las Vegas in the Northern Division. I have never been to Las Vegas but my Dad worked for Union Pacific so I will get used to being a Train Robber. I like the name and I am excited to move forward. Dustin Woodward will be my assistant. I would like to invite our loyal Las Cruces Fans to follow us and root for us in Las Vegas." The Train Robbers begin Spring Training May 6th in Las Vegas New Mexico.